I was extremely impressed with L’Atelier de Joël Robuchon during my first visit, and have raved about it ever since. I've been looking forward to my next visit to try out the rest of their menu, and I finally had the chance to do so a few days back when we took some friends out for dinner who were looking for fine French cuisine. Previously, my husband and I had the Discovery Degustation Menu. This time we decided to order ala carte to try out their other dishes, though we did do some repeat orders from our previous faves. 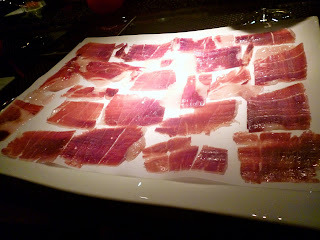 For starters, we had Le Jambon (SGD 61.00) which are thin slices of Iberian Ham or Jamon Iberico. It is made from a specific black Iberian pig and aged for about 36 months for the ultimate savory experience. This was heaven on a plate! Each bite completely melts in your mouth, and I could not get enough of each splendid slice. We were served with L'Amuse-Bouche (Complimentary). The foie gras custard with red Porto wine and parmesan foam was just as amazing as when I first tasted it. Definitely the best way to start out a great meal. I ordered L'Oursin (SGD 50.00) as an appetizer. 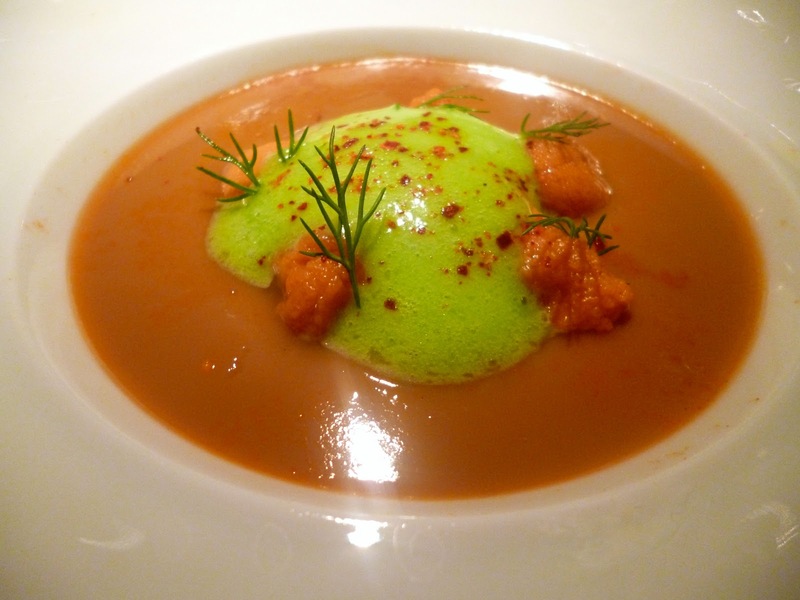 This is a sea urchin in a consomme jelly with wasabi cream. 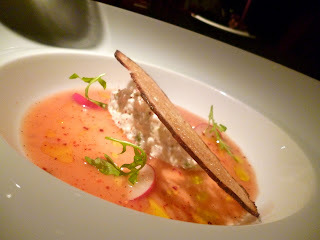 I was happy to see Japanese elements in a French dish. Sea urchin and wasabi combination has always been a winner to me. Taste wise I thought it was excellent, though the texture of the consomme jelly was a little unusual to me. Perhaps I'm just not used to eating a lot of savory jelly dishes. 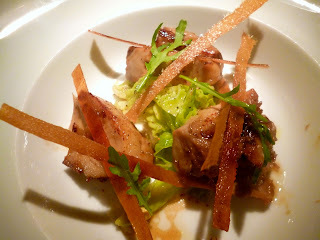 For starters, my husband ordered L'Hamachi (SGD 32.00) which he enjoyed from our last visit. My husband said it was still pretty good though it was not as memorable as when he first had it. 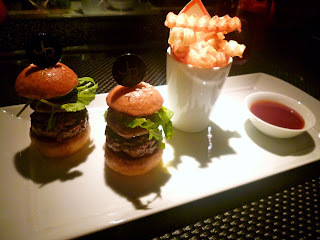 In this visit to L'Atelier, I believe I have found the holy grail of burgers-- Le Burger (SGD 51.00). Oh my gosh, what a gastronomic experience it was to have each bite of this sinfully delicious dish. 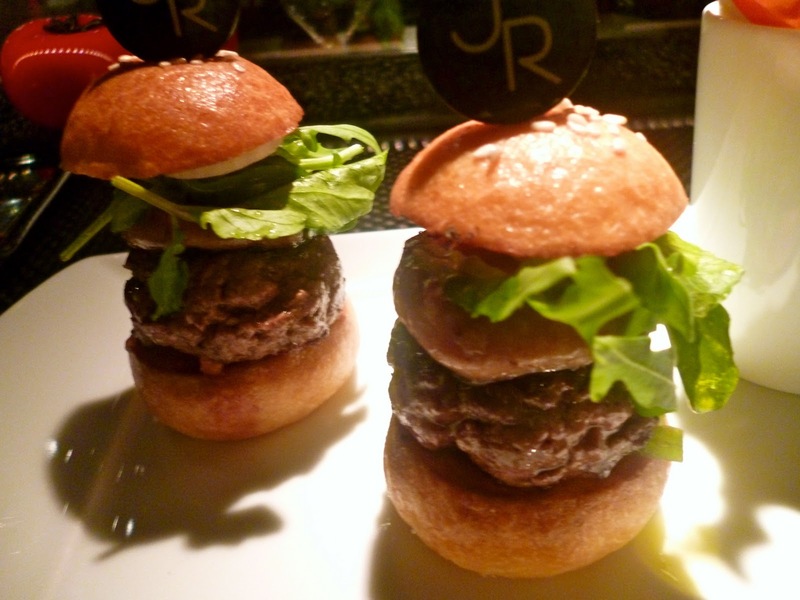 Each mini bun had an exquisite wagyu beef patty topped with foie gras and arugula leaves. Perfection! I completely fell in love with this burger. Close-up of Le Burger -- the holy grail of burgers! My husband ordered La Langoustine (SGD 47.00) since we enjoyed the langoustine we tasted before. I had a bite of this from my husband's plate and thought it was very nicely executed. 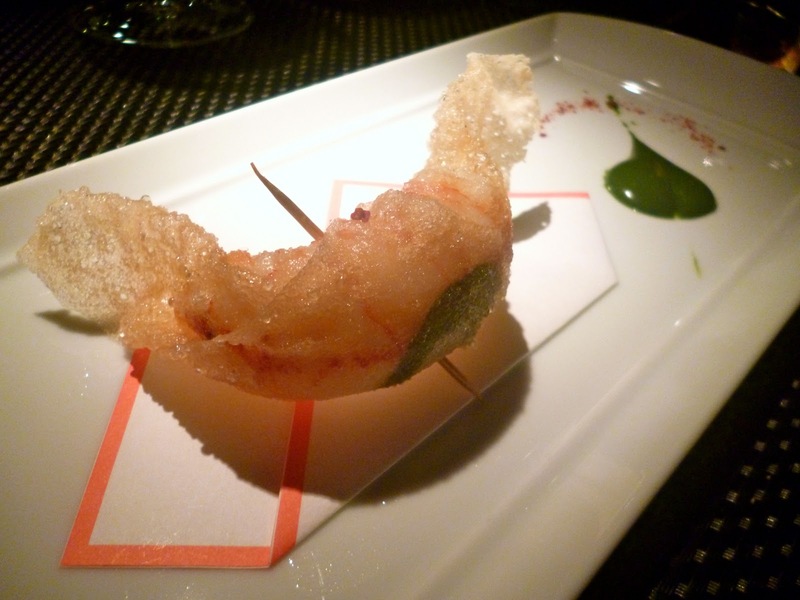 The crispy wanton added a nice texture to the fresh seafood. My husband and I also each had Le Cochon de Lait (SGD 47.00) or the suckling pig. I think I was too stuffed at this point to enjoy this, though I would still recommend this for serious pork lovers. For dessert I had Les Tartes (SGD 25.00). It had delectable slices of lemon, hazelnut, and vanilla tarts which are perfect for anyone with a serious sweet tooth. Do share this as this was definitely too much for one person. 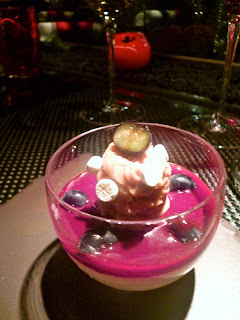 My husband had La Panacotta (SGD 25.00) which was beautifully presented with fresh blueberries. This was a very light and refreshing take on panacotta. 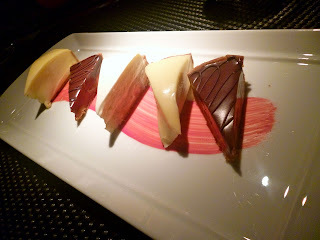 This was still an amazing experience at L’Atelier de Joël Robuchon. 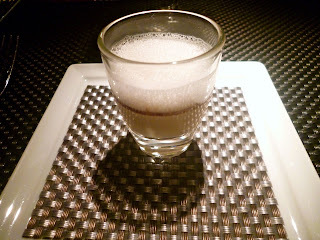 The ala carte menu was just as impressive as their degustation menu, and I was very happy to have found some new favorites. My top picks for the night were Le Jambon, Le Burger, and La Langoustine.